LTI Optics is always striving to improve customer support and provide you timely product updates and information to increase your productivity. If you have questions about your software, we invite you to review the sections below and check for new product downloads. Should you need to call us, our support hours are 8 AM - 5 PM MST. Please review the technical support policy. Our technical support staff can be reached at 720-891-0030. For photopia™ | reports™, our technical support is intended to answer any questions you may have about the use of the software, or how to apply a specific configuration item to a report, plot or table. It is beyond the scope of standard technical support to create a full custom template or report for you. You can create a custom template yourself using the information on this page. It will be helpful if you have a knowledge of HTML and XML as these are the languages of the reports. If you're not comfortable editing the HTML and XML configuration files to create a custom report, we are happy to offer this as a service. You'll just provide us with a template to match and we'll create all the custom files for your report. Email for a quote. photopia | reports is installed by default with Photopia and Photopia for SOLIDWORKS. photopia | reports can also be installed on its own. To obtain the installer, contact LTI Optics. photopia | reports will be automatically licensed if Photopia is on the same machine. For standalone installs, a license must be purchased from LTI Optics. photopia | reports creates vector plots and html tables, which allow you to export web and print ready reports directly into your page layout software like Adobe InDesign. Plots can be saved as SVG and PNG files. Reports can be saved as PNG and HTML files. Both Plots and Reports can be printed to PDF files. When viewing a plot or report, choose the Save button and specify the file name for the PNG file. By default the export will be at the window resolution. To modify the resolution, before exporting, choose Settings > Image Resolution and set the pixel value for the smallest side of the image. When viewing a plot, choose the Save button and specify the file name for the SVG file. When viewing a plot or report, choose the Save button and specify the file name for the HTML file. By default the export will be at the window resolution. The HTML file was designed for the Microsoft Edge browser, so if it is opened in another browser it may not render the same. Right click in the plot or report window and choose Print. You'll need to set the page margins and page scale to ensure that you fit the data onto the page. In Windows 10 you can print directly to a PDF. In earlier versions you'll need a PDF print driver, like Adobe Acrobat, CutePDF, or the DiaLUX PDF printer. The output from an entire set of IES or LDT files can be saved to the same format using command line parameters. The export argument requires an input file or files and supports wildcards. The type argument can be PNG | JPG | HTML | SVG | TXT. The configuration argument specifies the configuration file, which must be compatible with the requested type. You can customize any of the plots or data tables by creating a new style. The easiest way to do this is by copying an existing item that is similar and modifying it. The Program Files and Program Data folders may be hidden on your system. The easiest way to get there is by copying and pasting the paths above into the address bar of a Windows Explorer window. In this folder, find a style that you want to create a modification of. For each style, there will be an .xml file that specifies the configuration and a .png file that is a preview of the plot used in the program interface. Copy both of these files. Paste the two files into the ProgramData folder and rename them with a new name. Note that the first part of the name IntensityPlot - must remain since it defines the particular plot or table type that the files apply to. You can download the Gimp template file here to create your custom icon with. Open the file, edit text, layers and logos to create a logo you like, then export this as a .png file to the CustomStyle folder. Open the xml file in a text editor and edit the values based on what you want to change. This page contains details of what most elements do. You can manually create a preview image, or you can export an image from the tool and use that as the preview image. The Photometric Reports software generates all graphics as vector artwork, so they can be scaled to very high resolution. Throughout the configuration, some items will be referenced as pixel values (either thickness or position) and fonts as point values. These are not actual pixels, but coordinates used to create the vectors. Some items are referenced as a percentage of the overall plot size. Fonts are specified using the following block. Font family is similar to html/css referencing. Font size is specified in points. Within plots, the best way to turn off or hide a particular item is to set the color of that item to NULL_COLOR. The file name must begin with the words "IESReport" and can be followed by any other text. A thumbnail image with a square aspect ratio should be placed alongside the xml file with the same name. An IES Report is a collection of plots and tables that is rendered as HTML. The file contains style directives as well as information for each plot and table. The Style element is filled with CSS3 styles for formatting the report. The fragment element is used for direct HTML entities that will be placed into the report. Use this element for any formatting or static text. Items within a fragment should be contained within a CData entity to preserve characters. The CData element allows proper transfer of HTML from the report file to the final display. The file name must begin with the words "IntensityPlot" and can be followed by any other text. A thumbnail image with a square aspect ratio should be placed alongside the xml file with the same name. The size, in pixels, of the view. Controls the interpolation of the plotted candela data between values in the data file. Controls the overall window background and border. Controls the plot background and border. The legend position can be left,right,top, or bottom. The legend offset is a value in percent of the view extents that the legend is offset from the base position. The columnwidths are in percent of the view extents. The first number is the angle text, the second is the line illustration. When set to true, all data is displayed on the right half of the plot. When set to false, the data is plotted on the left and right half in full plane pairs. When set to true, uplight and downlight data is plotted. When set to false, only downlight data is plotted. When set to 0.0, the plots boundaries will be circular. When set to anything from 0.0 to 1.0, the plot will be zoomed to fit the data. At 1.0 the plot exactly fits the data, at 0.9, there is a 10% padding. The style gradient specifies the start and end horizontal angle styles and then creates a gradient between this. The series style override allows you to explicitly set the style for individual horizontal planes of data. This element is not necessary. The <key> is the horizontal plane in degrees. The plot title text and style. The radius markers are the circles at certain candela values. The angle markers are the lines from the center of the plot for each vertical angle. The file name must begin with the words "IntensityXYPlot" and can be followed by any other text. A thumbnail image with a square aspect ratio should be placed alongside the xml file with the same name. The padding around the plot inside the View Dimensions, in %. The % size of the View Dimensions that the plot occupies. The % offset inside the View Dimension from the lower left hand corner. The axis markers for the x and y axis. The x and y axis can have unique intervals, but share formatting. The file name must begin with the words "ISOIlluminance" and can be followed by any other text. A thumbnail image with a square aspect ratio should be placed alongside the xml file with the same name. Controls the display of the peak intensity and 50% intensity labels common on roadway plots. Sets the X and Y axis to be defined in units of mounting height or absolute distance. Sets the mounting height of the luminaire, either in feet to display footcandles or meters to display lux. Allows you to adjust the aiming of the luminaire using the standard Orientation, Tilt, and Spin values defined by the IES. Sets the text value of various labels. Leave an element empty to omit a label. Using the common font setting, you can set the font of each label type independently. Contours can be specified at specific illuminance values using the <contours> element. Contours can be specified at specific percents of the peak illuminance value using the <percent-contours> element with multiple values. Contours can be specified at uniform percent increments of the peak illuminance values using the <percent-contours> element with a single value, such as every 5% in the example below. Contours labels can be set to on (1) or off (0). Contours labels can be rounded to a specified number of decimal places. Contour style can be specified as fixed for all contours. Or contour style can be specified as a gradient. The plane background is filled with a gradient where the start and end values are specified and apply to the max and minimum values on the plane. This is essentially a false color illuminance plot. A legend will be displayed on the right side of the plot. Plane Data Resolution sets the number of points in X and Y on the plot that will be used to compute the illuminance values. Plane Data Unit allows the plane to display either illuminance (fluxdensity) or intensity. Independent major and minor grids can be setup on the plot. Major grids can be labeled, minor grids are just grid lines. Frequency is how often the grid should occur, and will match the units of the domain. Line styles can be specified as CSS styles. The file name must begin with the words "CUXYPlot" and can be followed by any other text. A thumbnail image with a square aspect ratio should be placed alongside the xml file with the same name. Controls the interpolation of the plotted CU data between values in the data file. Specifies the style of the street side data line. Specifies the spacing to mounting height ratios to compute and plot. The style for the x axis. The style for the y axis. The file name must begin with the words "LCSPlot" and can be followed by any other text. A thumbnail image with a square aspect ratio should be placed alongside the xml file with the same name. The size padding around the plot, in a fraction. 0 to plot lumens(energy), 1 for % of lamp, 2 for % of luminaire. Specifies for each zone the fill and stroke. The valid zones are BVH, BH, BM, VL, FVH, FH, FM, FL, UH and UL. Specifies which keys from the IES file to display in the table. If left blank, all keys will be displayed. Controls the display of the column header values. Controls the display of the row header values. A number multiplied by the candela values in the IES file before they are displayed in the table. Set to 0 the columns are horizontal angles, set to 1, the columns are vertical angles. If this keyword is included, each cell in the table will be assigned a class based on the intensity value matching one of the zones. The zones are defined by a class (key) and then a value range. These numbers are a % of the peak intensity. This class can then be styled. This allows you to highlight certain candela values. Custom zones are created by using the key as the start angle and the value as the end angle. Decimal rounding for the angle display. Decimal rounding for the data display. There are 5 columns that can be displayed and labeled. Zone Centers is the angle value at the zone center, Zone Range is the start-end range, Energy is the total lumens in the zone, Energy over Input is the lumens over the total lamp lumens, and Energy over Output is the lumens over the total output lumens. Specify the spacing over mounting height ratios to include. Label used for each of the 3 rows, separated by a comma. Vertical angles to display, empty will display all. Horizontal angles to display, empty will display all. Columns for mounting height, illuminance, 0-180 and 90-270 beam diameter can be displayed, labeled, and rounded individually. Specify the RCRs to display (Room Cavity Ratio). Specify the reflectance groups to display. 0 displays % luminiare, 1 displays % lamp, 2 displays lumens. Set unit labels and column labels for the table. Within this section, you can use a CDATA element to write HTML that will be injected with the variable values you specify. Specify the rounding for each variable. Having the correct Photometric Settings is critical to obtaining accurate results from Photopia. When you send a product for testing, the laboratory often determines the correct photometric angles, but when you are running Photopia it is something you must always be aware of. 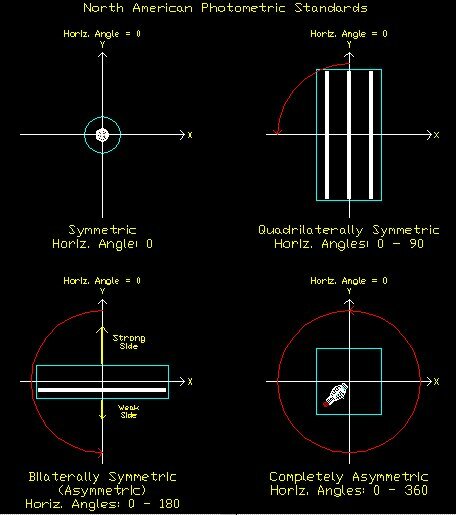 The angle sets are often broken down to vertical and horizontal angles, described below. Vertical photometric angles go from directly below the fixture at 0 degrees to directly above at 180 degrees. The vertical angles that you choose are governed by the vertical distribution of your product. See the table below for information on the correct choice of vertical angles. 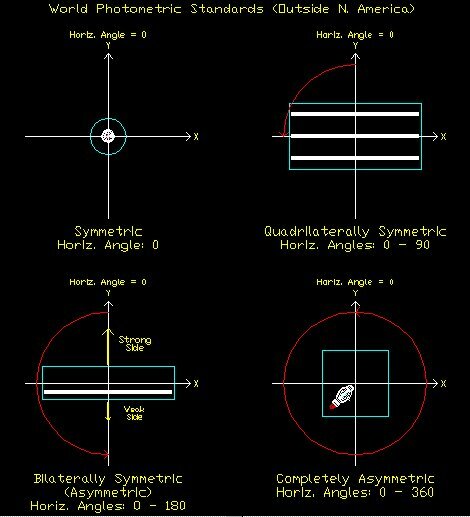 The horizontal photometric angles that you will choose depend on the horizontal symmetric of your product. Fixtures can have four types of symmetry, as outlined in the table below. In Photopia it is important to choose the correct angle set based on the fixture symmetry because otherwise the output can become incorrect. Photopia always has data for the full 0-360 degrees, but averages down to the angle set that you choose. In the extreme case all 360 degrees are averaged together when you choose a horizontal angle of "0" only. As Photopia has come to be more widely used in the architectural lighting industry, an increasing number of Photopia generated photometric files are being distributed by lighting manufacturers to their customers. By photometric files, we are referring to IES files in North America and TM-14 or EULUMDAT in other regions of the world. The original intent of Photopia was to allow manufacturers to develop new designs more quickly and more cost effectively by evaluating their design ideas on their computer instead of building and testing each and every design alternative. Once the predicted design performance met the desired criteria, a prototype was built and physically tested. If the physical test did not meet the design requirements, then modifications would be made until the requirements were met. In many cases, this involved troubleshooting the design to ensure it was built to specifications, so that it matched what was modeled in Photopia. Photopia is no longer only used in the development of new standard products. It is also used to model the performance of custom luminaires where the time from concept to installation does not allow for the classic product development cycle. Additionally, it is being used to model some existing products for which photometric testing was never before required. In these cases and others, some manufactures will distribute photometric files generated by Photopia. Whenever a photometric file generated by Photopia is distributed to a customer, the data should be as accurate as possible. The consequences of the photometric data not being accurate can be very costly if you are called out to fix an installed job. The distribution of inaccurate data also hurts Photopia's reputation and therefore its overall value. So it is in everyone's interest to ensure photometric data generated by Photopia is as accurate as possible. You need to build exactly what you have modeled. If you compromise and choose a similar lamp or materials to the ones you will actually use, then you can expect differences between the predicted and measured photometry. You need to understand your manufacturing tolerances for all of the parts in your design. You can create a range of Photopia models for the expected range of part configurations to gain a better understanding of the expected range of photometric performance. You need to understand how to use Photopia well enough to properly setup your analysis so you get accurate results. This means properly orienting your luminaire, using the proper angle set in the candela distribution, using the proper number of reflections and the proper number of rays. See this link for more information about photometric standards. Some issues such as thermal effects are completely ignored by Photopia, so if you have thermally sensitive lamps then you know that there will be differences between the simulated and measured efficiencies. Anisotropic materials are only supported in Version 3.0. So if you use a material with a significant grained texture such as Alanod Miro 5, then the anisotropic properties need to be accurately modeled within Version 3.0. For more information about the factors that affect the accuracy, see Appendix C of the User's Guide. Leave the [TESTLAB] keyword in the IES file exactly how Photopia has defined it. This will ensure that your customers know that the file is the result of a simulation and not a physical test. Remove all lines with the [OTHER] keyword. This information is useful to the optical designer, but not necessarily to your customers. This data could invite questions from your customers about details of the analysis that are not important. You can edit the IES file in Notepad. You should review the total luminaire watts as defined in the IES file. This value is set according to the default lamp and assumed ballast wattage for the Photopia lamp model. If you have more accurate information about the total luminaire watts, then use it. See the end of Appendix B of the User's Guide for the IES file format. Be sure to let your customers know that the data is simulated when you distribute the files either in your e-mail or on your website so that there is no misunderstanding about this issue later on. Lighting Application Software is typically used by lighting designers, electrical engineers, or architects to determine how many of what type of luminaire are required in a given space to achieve a certain light level or effect. There are currently several pieces of lighting application software that are widely used. AGi32 - Commercial software widely used by lighting designers. Visual - Software from Acuity Brands Lighting. Relux - Software sponsored by manufacturers, free for users. DIALux - Software sponsored by manufacturers, free for users. * This list is not meant to be comprehensive or an endorsement of any particular software, but merely as a resource for our customers.